Tuscany OASIS residence rents apartments for holidays by the sea with private pool and park. Tuscany, Campiglia M. ma, the residence offers apartments OASIS - Holiday by the sea; located in a beautiful natural park of 3 hectares, composed of secular cork oaks and typical Mediterranean vegetation. At disposal of our guests, a large shaped pool 'L' of mt. 15 x 12 deck chairs, umbrellas, barbecue and private parking. Possibility of trekking and bicycle rides in the beautiful Tuscan hills. 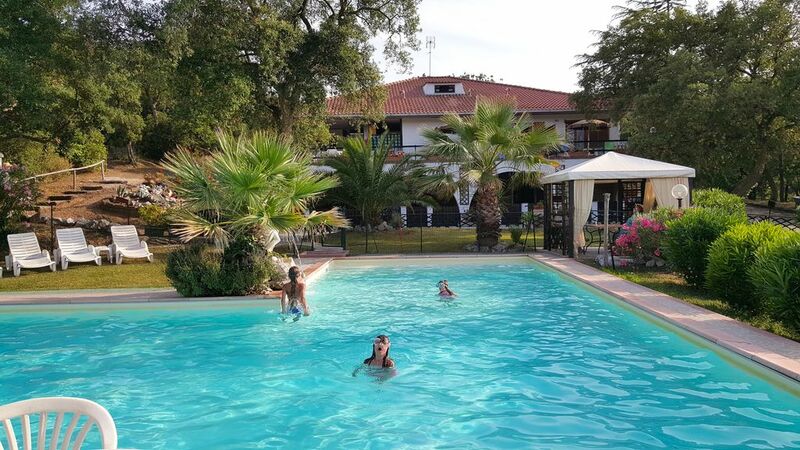 In Tuscany, at Campiglia Marittima we offers holiday apartments by the sea, completely Call Immersed in 3 hectares of beautiful natural park with a 15 x 12 m swimming pool and private parking. Available for all are: barbecues and gazebos, table tennis and satellite TV. The residence offers a modern furnished and equipped 2 room apartments of 40 m² with independent entrance, double bedroom, bathroom, living room with sofa bed and kitchen. The villa apartment offers 160 m² on two floors, elegantly decorated in Tuscan style with independent entrance, large living room with beautiful staircase, wide fireplace, kitchen and sofa bed, two bedrooms on the first floor, 2 bathrooms Each floor and a terrace with deckchairs and table. Studios with separate entrance made up of a double bed + single bed, bathroom, kitchenette and private table and deckchairs outside. And two independent villas. The Oasis Residence in the heart of the Etruscan Coast offers a variety of vacation opportunities either: a vacation by the sea San Vincenzo and its sandy beaches, at Km 6. Rimigliano park with tables and chairs for a nice picnic and beach "free entry". Piombino pier to the island of Elba. A cultural holiday Populonia (12 km) Suvereto (10 km), Massa Marittima (30 km), Bolgheri-Castagneto Carducci (23 km), Volterra (1 ½ hours approximately), San Gimignano (1 ½ hours approximately), Pisa (1 hour), Siena (about 1½ hours), Florence (2 hours). Or under the banner of nature and wellbeing: Thermal center, protected natural parks, possibility of trekking and horse riding, tennis. Of great historical interest archéomineral the park of San Silvestro 500 mt. and the small town of Campiglia M. my (600 mt. ), typical medieval village.